Publications are “contributed” by authors to the SRO. This is less of a misconception than a semantic slip. It is true that some authors enter publication data by hand into an online form, but more than 75% of publications listed in the SRO are collected automatically, without any input by the author(s). 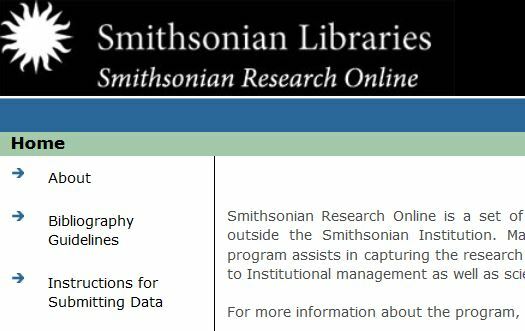 Stored searches and email alerts notify Libraries staff of online publications written by Smithsonian scholars and by using reference management tools for data capture, the need for the author to enter this data is circumvented. This is the primary reasons for the success of the program. Most of us recognize that if we relied on authors to actively remember and to enter complete publication data, the program would not have gotten off the ground. So when someone recently asked, “Is [X Smithsonian Unit] giving us their publications?” the answer is yes and no. We have collected the publications but for most publications it would be inaccurate to say that authors who work at this unit are *giving* it to us. It’s more accurate to say the SRO team is getting the data. The Repository holds digital reprints of all Smithsonian staff publications. Although this is subject to change in the near future, currently only about 30% of Smithsonian publications have corresponding full text reprints in the Repository. Due to a number of factors, authors do not submit all of their electronic reprints to the SRO for inclusion in the Repository. However, in response to the White House Office of Science and Technology Policy, that is likely to change. It is now widely recognized that outputs of federally funded research should be made publicly available and the SRO is preparing with other Smithsonian offices to make this happen. The SRO has every publication written by Smithsonian staff. Worded this way, it is a loaded assertion. Libraries staff are working on a complete list of all publications authored by Smithsonian staff since the Institution’s founding. But because we are working from old annual reports of the Smithsonian, some publication data is difficult to decipher. (Some might call it “biblio-forensics”). Over the years, the Institution has tried valiantly to maintain a list of staff publications with varying degrees of success. Some years were missed entirely, others contain duplicate entries from previous years or data which is abbreviated or cryptic to be rendered almost useless. For example, this list of publications from 1913 while impressive, is likely incomplete. One day we may be able to say we have collected 95% of all Smithsonian staff-authored publications but we are not there yet. 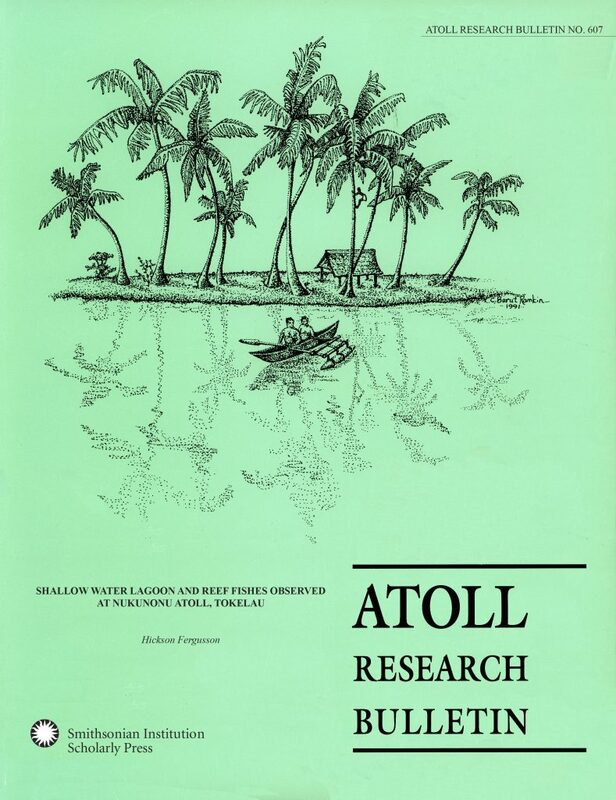 Cover of “Shallow Water Lagoon and Reef Fishes Observed at Nukunonu Atoll, Tokelau”, Atoll Research Bulletin No. 607. available in SRO. In addition, the SRO tags selected publications which an author wrote prior to coming to the Smithsonian.This allows us to include an author’s full publication list on his/her website while reports to directors and other administration list only publications representing current Smithsonian scholarship. Even for recent years, it is impossible to say that we have every publication. It reminds me of the popular question Library of Congress staff hear when they are asked whether the Library of Congress “has every book”. The SRO is about peer-reviewed scholarship. As noted above, the SRO team augments standard publication data with various “tags.” For example we add the unit name (e.g. Smithsonian American Art Museum, Smithsonian Environmental Research Center, etc.) for reporting by museum or research center. But only in 2011 did the SRO begin applying the term, “peer-reviewed” to publications. And even here the data is not perfect. We do the best we can but when we collect letters, editorial/commentaries, obituaries, etc. which are published in peer-reviewed journals, we classify them as peer-reviewed even though they may not be. In addition to cases like these, the SRO sometimes includes publications which appear in popular journals, newspapers and even blog entries which may not be peer-reviewed. The SRO is a library research tool. The SRO is primarily a management reporting tool, documenting a part of the total research output of the Institution. And while the SRO is available for anyone to use, the primary audience of the service is not what we think of as a typical library user. * The communities to whom the SRO has the greatest appeal are administrative offices, public affairs, webmasters and those that are not often considered core library researchers. It is a non-traditional library service which at other libraries are called variously, “Faculty Bibliography” or “Scholarly Communication Services”, etc. But the SRO does not represent a comprehensive list of publications on any particular subject and is not the first place any of us would go to find information. *However those doing research in the history of the Institution may find the database helpful in their research. Amongst these, I believed that Publications are “contributed” by authors to the SRO and tha The SRO has every publication written by Smithsonian staff. Thank you for clearing then air.